Users, and roles control who has access to vSphere components and what actions each user can perform. A role is a predefined set of privileges. Privileges define rights to perform actions and read properties. For example, the Virtual Machine Administrator role consists of read properties and of a set of rights to perform actions. 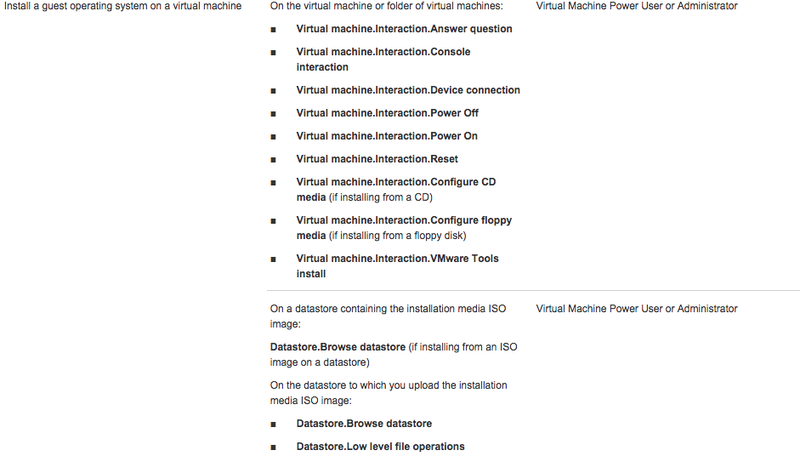 The role allows a user to read and change virtual machine attributes. When you assign permissions, you pair a user or group with a role and associate that pairing with an inventory object. A single user or group can have different roles for different objects in the inventory. You can view, sort, and export lists of a host’s local users to a file that is in HTML, XML, Microsoft Excel, or CSV format. 1. Log in to ESXi using the vSphere Client. 2. Click the Local Users & Groups tab and click Users . 3. Determine how to sort the table, and hide or show columns according to the information you want to see in the exported file. ■ To sort the table by any of the columns, click the column heading. ■ To show or hide columns, right-click any of the column headings and select or deselect the name of the column to hide. 4. Right-click anywhere in the table and click Export List to open the Save As dialog box. 5. Select a path and enter a filename. 6. Select the file type and click OK.
A permission is set on an object in the vCenter object hierarchy. Each permission associates the object with a group or user and the group’s or user’s access roles. For example, you can select a virtual machine object, add one permission that gives the ReadOnly role to Group 1, and add a second permission that gives the Administrator role to User 2. By assigning a different role to a group of users on different objects, you control the tasks that those users can perform in your vSphere environment. For example, to allow a group to configure memory for the host, select that host and add a permission that grants a role to that group that includes the Host.Configuration.Memory Configurationprivilege. Each object in the vCenter Server object hierarchy has associated permissions. Each permission specifies for one group or user which privileges that group or user has on the object. On vCenter Server systems, you can assign privileges only to authenticated users or groups of authenticated users. Users are authenticated through vCenter Single Sign-On. The users and groups must be defined in the identity source that vCenter Single Sign-On is using to authenticate. Define users and groups using the tools in your identity source, for example, Active Directory. Roles allow you to assign permissions on an object based on a typical set of tasks that users perform. Default roles, such as Administrator, are predefined onvCenter Server and cannot be changed. Other roles, such as Resource Pool Administrator, are predefined sample roles. You can create custom roles either from scratch or by cloning and modifying sample roles. Privileges are fine-grained access controls. You can group those privileges into roles, that you can then map to users or groups. After a user or group and role pair is set for an inventory object, you can change the role paired with the user or group or change the setting of the Propagate check box. You can also remove the permission setting. Browse to the object in the vSphere Web Client object navigator. Click the Manage tab and select Permissions. Click the line item to select the user or group and role pair. Click Change role on permission. Select a role for the user or group from the Assigned Role drop-down menu. To propagate the privileges to the children of the assigned inventory object, click the Propagate check box and click OK.
After you create users and groups and define roles, you must assign the users and groups and their roles to the relevant inventory objects. You can assign the same permissions to multiple objects simultaneously by moving the objects into a folder and setting the permissions on the folder. When you assign permissions from the vSphere Web Client, user and group names must match Active Directory precisely, including case. If you upgraded from earlier versions of vSphere, check for case inconsistencies if you experience problems with groups. On the object whose permissions you want to modify, you must have a role that includes the Permissions.Modify permission privilege. Browse to the object for which you want to assign permissions in the vSphere Web Client object navigator. Click the Add icon, and click Add. Identify the user or group that will have the privileges defined by the selected role. From the Domain drop-down menu, select the domain where the user or group is located. Type a name in the Search box or select a name from the list. The system searches user names, group names, and descriptions. Select the user or group and click Add. The name is added to either the Users or Groups list. (Optional) Click Check Names to verify that the user or group exists in the identity source. Select a role from the Assigned Role drop-down menu. The roles that are assigned to the object appear in the menu. The privileges contained in the role are listed in the section below the role title. (Optional) To limit propagation, deselect the Propagate to Child Objects check box. The role is applied only to the selected object and does not propagate to the child objects. Click OK to add the permission. 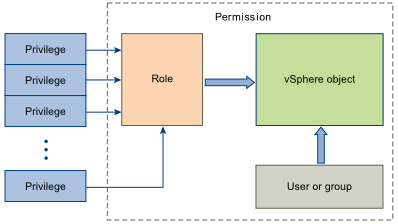 The permission model for vCenter Server systems relies on assigning permissions to objects in the vSphere object hierarchy. Each permission gives one user or group a set of privileges, that is, a role for the selected object. 1. Select the object in the vCenter object hierarchy to which you want to apply the permission. 2. Select the group or user that should have privileges on the object. 3. Select the role, that is the set of privileges, that the group or user should have on the object. By default, permissions propagate, that is the group or user has the selected role on the selected object and its child objects. When you assign a permission to an object, you can choose whether the permission propagates down the object hierarchy. You set propagation for each permission. Propagation is not universally applied. Permissions defined for a child object always override the permissions that are propagated from parent objects. Most inventory objects inherit permissions from a single parent object in the hierarchy. For example, a datastore inherits permissions from either its parent datastore folder or parent data center. 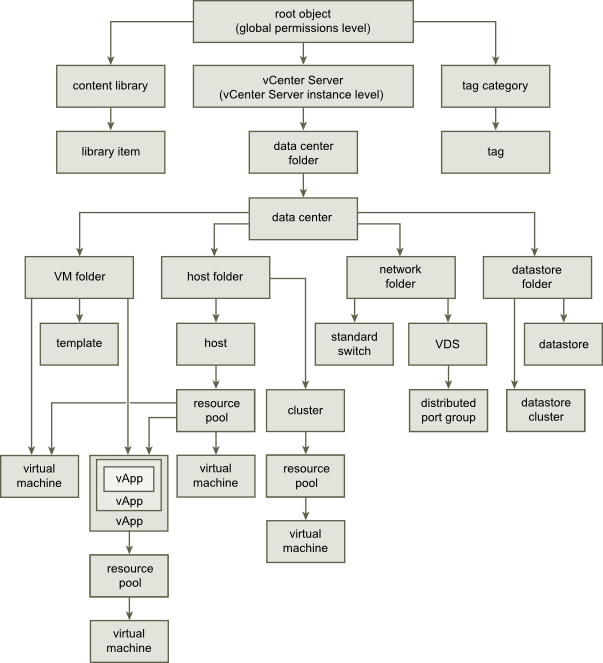 Virtual machines inherit permissions from both the parent virtual machine folder and the parent host, cluster, or resource pool simultaneously. You can create vCenter Server custom roles to suit the access control needs of your environment. If you create or edit a role on a vCenter Server system that is part of the same vCenter Single Sign-On domain as other vCenter Server systems, the VMware Directory Service (vmdir) propagates the changes that you make to all other vCenter Server systems in the group. Assignments of roles to specific users and objects are not shared across vCenter Server systems. 1. Log in to vCenter Server with the vSphere Web Client. 2. Select Home, click Administration, and click Roles. 3. Click the Create role action (+) button. 4. Type a name for the new role. 5. Select privileges for the role and click OK.
Once you’ve created or modified the roles as needed, you can assign the roles to the users and groups associated with your ESX/ESXi host or vCenter Server. You can make a copy of an existing role, rename it, and edit it. When you make a copy, the new role is not applied to any users or groups and objects. You must assign the role to users or groups and objects. If you create or edit a role on a vCenter Server system that is part of the same vCenter Single Sign-On domain as other vCenter Server systems, the VMware Directory Service (vmdir) propagates the changes that you make to all other vCenter Server systems in the group. Assignments of roles to specific users and objects are not shared acrossvCenter Server systems. 3 Select a role, and click the Clone role action icon. 4 Type a name for the cloned role. 5 Select or deselect privileges for the role and click OK.
3. Select a role and click the Edit role action button. 4. Select or deselect privileges for the role and click OK. The VMware Directory service (vmdir) is associated with the domain you specify during installation and is included in each embedded deployment and on each Platform Services Controller. This service is a multi-tenanted, multi-mastered directory service that makes an LDAP directory available on port 389. The service still uses port 11711 for backward compatibility with vSphere 5.5 and earlier systems. If your environment includes more than one instance of the Platform Services Controller, an update of vmdir content in one vmdir instance is propagated to all other instances of vmdir. Starting with vSphere 6.0, the VMware Directory Service stores not only vCenter Single Sign-On information but also certificate information. If you decide to use a new VMCA root certificate, and you unpublish the VMCA root certificate that was used when you provisioned your environment, you must replace the machine SSL certificates, solution user certificates, and certificates for some internal services. If you unpublish the VMCA root certificate, you must replace the SSL Signing Certificate that is used by vCenter Single Sign-On. See “Refresh the Security Token Service (STS) Root Certificate,” on page 36. You must also replace the VMware Directory Service (vmdir) certificate. Request a certificate for vmdir for your third-party or enterprise CA. Copy the certificate and key that you just generated to the vmdir location. Restart vmdir from the vSphere Web Client or using the service-control command. There a few things to keep in mind when configuring access controls in VMware, however. First of all, if a group is assigned a role, all of the users in that group are given those same privileges unless the users have roles of their own assigned. Second of all, if a user is assigned privileges in VMware, those privileges take precedence over the privileges of the group. For example, User A and User B are assigned to Group 1. Group 1 has been assigned the Read-Only role. User A doesn’t have a role assigned to it, so it automatically gets all of the permissions given to Group 1. User B, however, has been assigned the No Access role, so User B has no permissions at all. VMware also validates the users and groups in Windows Active Directory against the users and groups in vCenter Server. So, if a user or group exists in vCenter Server, but doesn’t exist in the domain, VMware will delete all of the permissions associated with the user or group during validation. You can also assign privileges to multiple inventory objects in VMware by creating a folder and moving all of the appropriate objects to that folder. 2. Right-click an empty area in the right pane, then click “Add Permissions” to open the Assign Permissions window. 3. Click “Add” and insert the appropriate user(s) or group(s). Select the desired role for the user(s) from the drop-down menu. 5. Click “OK” to assign the permissions to the selected user(s) or group(s). vCenter Server periodically validates its user and group lists against the users and groups in the Windows Active Directory domain. It then removes users or groups that no longer exist in the domain. You can change the interval between validations. From the vSphere Client connected to a vCenter Server system, select Administration > vCenter Server Settings. In the navigation pane, select Active Directory. (Optional) Deselect the Enable Validation check box to disable validation. Validation is enabled by default. Users and groups are validated when vCenter Server system starts, even if validation is disabled. If validation is enabled, enter a value in the Validation Period text box to specify a time, in minutes, between validations. Many tasks require permissions on more than one object in the inventory. You can review the privileges that are required to perform the tasks and, where applicable, the appropriate sample roles. Any operation that consumes storage space, such as creating a virtual disk or taking a snapshot, requires the Datastore.Allocate Space privilege on the target datastore, as well as the privilege to perform the operation itself. Moving an object in the inventory hierarchy requires appropriate privileges on the object itself, the source parent object (such as a folder or cluster), and the destination parent object. Each host and cluster has its own implicit resource pool that contains all the resources of that host or cluster. Deploying a virtual machine directly to a host or cluster requires the Resource.Assign Virtual Machine to Resource Pool privilege. The images below present common tasks that require more than one privilege. You can add permissions to inventory objects by pairing a user with one of the predefined roles, or you can create custom roles with the set of privileges that you expect to use multiple times. System roles are permanent. You cannot edit the privileges associated with these roles. VMware provides sample roles for certain frequently performed combination of tasks. You can clone, modify or remove these roles. A role is a predefined set of privileges. When you add permissions to an object, you pair a user or group with a role. vCenter Server includes several system roles, which you cannot change. vCenter Server provides a small number of default roles. You cannot change the privileges associated with the default roles. The default roles are organized as a hierarchy; each role inherits the privileges of the previous role. For example, the Administrator role inherits the privileges of the Read Only role. Roles that you create do not inherit privileges from any of the system roles. Users assigned the Administrator role for an object are allowed to view and perform all actions on the object. This role also includes all privileges inherent in the Read Only role. If you are acting in the Administrator role on an object, you can assign privileges to individual users and groups. If you are acting in the Administrator role in vCenter Server, you can assign privileges to users and groups in the default vCenter Single Sign-On identity source. Supported identity services include Windows Active Directory and OpenLDAP 2.4. By default, the administrator@vsphere.local user has the Administrator role on both vCenter Single Sign-On and vCenter Server after installation. That user can then associate other users with the Administrator role on vCenter Server. Users assigned the No Access role for an object cannot view or change the object in any way. New users and groups are assigned this role by default. You can change the role on an object-by-object basis. The administrator@vsphere.local user, the root user, and vpxuser are the only users not assigned the No Access role by default. Instead, they are assigned the Administrator role. You can remove the root user from any permissions or change its role to No Access as long as you first create a replacement permission at the root level with the Administrator role and associate this permission with a different user. Users assigned the Read Only role for an object are allowed to view the state of the object and details about the object. With this role, a user can view virtual machine, host, and resource pool attributes. The user cannot view the remote console for a host. All actions through the menus and toolbars are disallowed. Virtual Machine User: Grants user access rights exclusively to VMs. The user can power on, power off, and reset the virtual machine, as well as run media from the virtual discs. Click here for a complete list of Defined Privileges. Each solution has a root object in its own object hierarchy. The global root object acts as a parent object to each solution object. You can assign global permissions to users or groups, and decide on the role for each user or group.